Step dance, mouth music, beat-boxing and body percussion. Scottish step dancer Sophie Stephenson, Gaelic singer Eilidh Munro and champion beatboxer extraordinaire Bigg Taj are bringing TradBeats to Celtic Connections in Glasgow! The workshop will introduce you to Gaelic mouth music, step dance, beatboxing and body percussion, accumulating in a group collaboration which encourages participants to experiment and improvise using the core elements of voice and movement to create rhythm. Everyone is welcome! 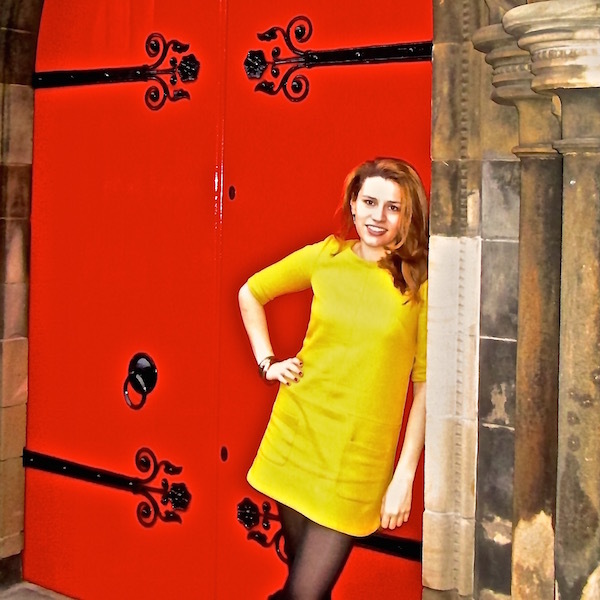 Sophie Stephenson is a traditional Scottish step dancer who’s teaching repertoire draws on a variety of percussive dance styles. 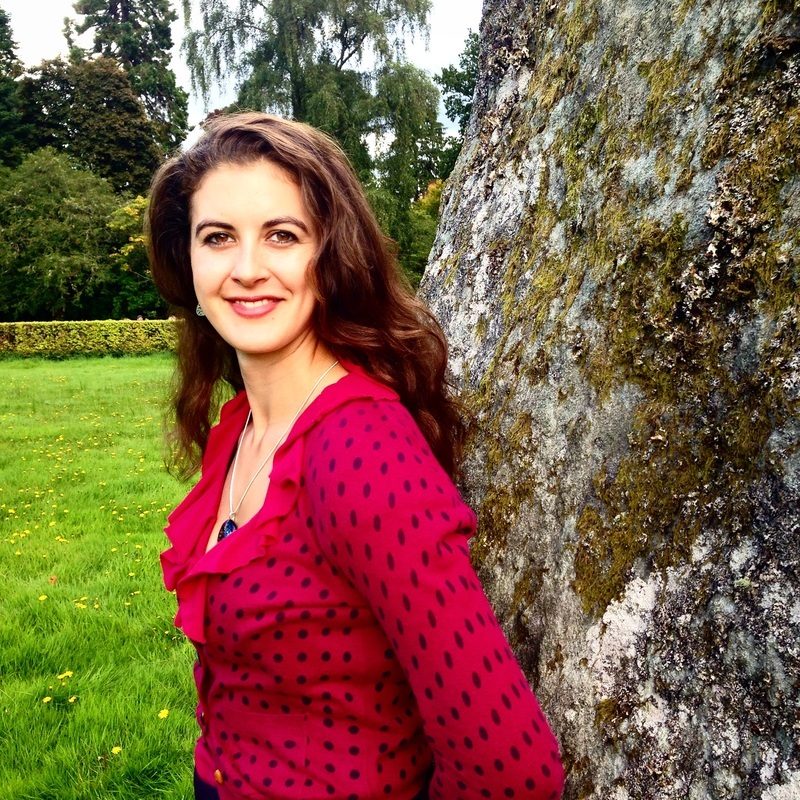 In this special workshop for Celtic Connections, Sophie will explore rhythm and movement using footwork and body percussion. Book tickets here. 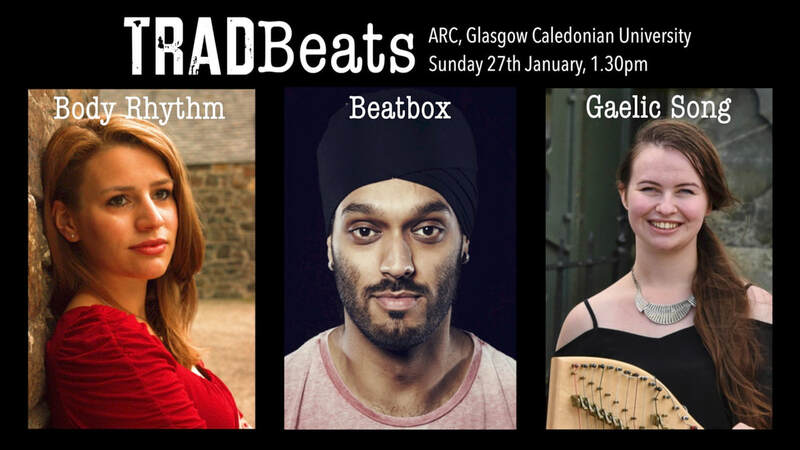 The workshop is a great introduction to body music for those who are interested in attending the TradBeats workshop with Sophie Stephenson, Eilidh Murnro (Gaelic Song) and Bigg Taj (Beatbox) on Sun 27th Jan. Remember to bring water bottle and a pair of hard-soled shoes! TradBeats has traditional arts at its core but re-awakens them in a modern, upbeat context. Developed by step dancer Sophie Stephenson, TradBeats is an exciting new project which explores the rhythmical links between Gaelic mouth music, step dance, beatboxing and body percussion. 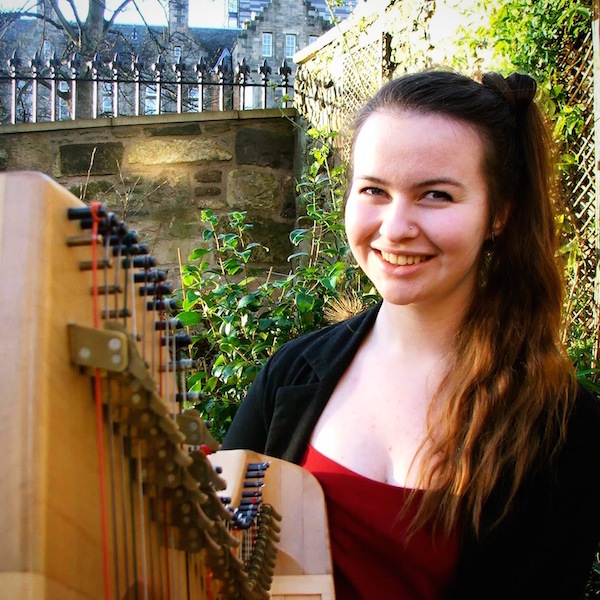 TradBeats offer workshops led by Sophie Stephenson along with beatboxer Bigg Taj and Gaelic singers Eilidh Munro and Màiri Britton. There will be workshops in each of the disciplines, accumulating in a group collaboration which encourages participants to experiment and improvise using the core elements of voice and movement to create rhythm. If you are interested in taking part in TradBeats or if you are an organisation which would like to host workshops in Gaelic mouth music, step dance, beat-boxing and body percussion then please contact Sophie on 07783433807 or email sophie@sophabulous.co.uk. I loved all the separate activities and the way everyone got to work together and incorporate the different skills to create something cool. It was also great being able to bring along friends who didn't have much knowledge before that of playing trad instruments but they could still join in with everyone and have a fun time because everyone was learning new skills. I'd never really done any beat boxing before. And that was a whole new experience. Also it was fab to learn some new Gàidhlig songs and get more in depth help with step dancing and body percussion. Using our bodies to create sound and rhythm has been intrinsic to oral cultures across the globe for generations. In Gaelic and Scots culture there is a long tradition of this through work songs, playground rhymes, vocal dance tunes and audible percussive movement which is driven by a human impulse to create and experience rhythm. The close relationship between voice and movement is established from the very moment we are first cradled in our mother’s arms as she sings a song. This is evident in Scotland from our rich repertoire of lullabies and mouth music. I remember as a toddler being bounced on my mother's knee whilst she diddled tunes. In this manner we are exposed to music and dance simultaneously from birth. Modern society often likes to categorise music and dance as separate disciplines, but they are very much interlinked. Indeed, percussive movement such as step dancing is akin to a percussive instrument which can be both a response to the music and provide the rhythmic impetus behind the melody. With TradBeats I wanted to tap into this groove which is so innate to our very beings whilst drawing from a rich repertoire of songs and steps in Scotland. I hoped to showcase the rhythmical connection between the Gaelic language and the song and dance traditions, whilst also encompassing beatboxing and body percussion to establish links across genres and create a new context for traditional dance. Many dance tunes commonly known today were passed down as puirt-à-beul (mouth music) and come from an oral tradition which dates back further than the instruments they are now played on. The concept behind TradBeats comes from this idea of creating music without instruments. It is a tuition festival which brings together voice and movement in an organic way within the context of aural, oral and visual cultural transmission. Participants are introduced to puirt-à-beul, diddling and lilting alongside step dance, body percussion and beat-boxing. These elements are then brought together through group collaboration which allows for improvisation. The format of TradBeats differs from typical music tuition. The workshops all take place in one room without tables or chairs or music stands or white boards – just a big space with everyone together. Within the circle it is hoped that we create a relaxed and informal environment and a feeling of togetherness in which participants are free to experiment with rhythm and harmony. This is important to the ethos of TradBeats which is to be inclusive regardless of experience or ability. One of the best things about TradBeats is that it offers people access to traditional music without requiring them to have any previous experience, or even to own an instrument. They can turn up just as they are - no equipment, no prescribed footwear - and get involved right away. TradBeat's ethos of inclusion and collaboration means it is open to everyone, especially those who have been unable to afford an instrument or to access music lessons until now. At the same time, however, TradBeats can be of great benefit to accomplished and technically skilled musicians and dancers, challenging them to approach rhythm and melody in a new way. To date TradBeats has delivered workshops at Sabhal Mòr Ostaig on Skye, TradFest in Edinburgh and the Borders Book Festival in Melrose, Sgoil Chiùil Na Gàidhealtachd in Plockton, all with great feedback and responses. I am extremely excited for the future development of TradBeats and would love to hear from any festivals, arts organisations or educational institutions who would be interested in bringing TradBeats to their communities. 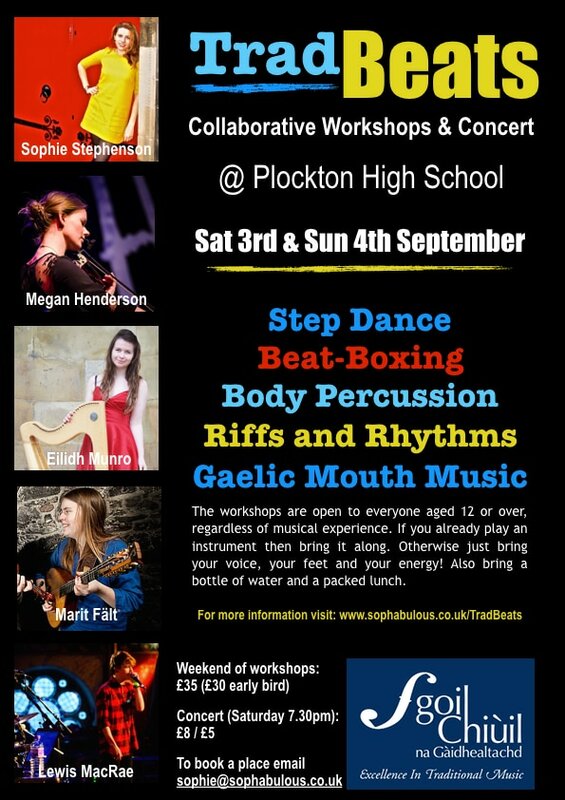 TradBeats are delighted to announce that Sgoil Chiùil Na Gàidhealtachd will be hosting a weekend festival at Plockton High School on Saturday 3rd and Sunday 4th September 2016. Over the course of the weekend there will be various workshops in Gaelic mouth music, step dance, beatboxing and body percussion, culminating in a group collaboration which encourages participants to experiment and improvise using the core elements of voice and movement to create rhythm. 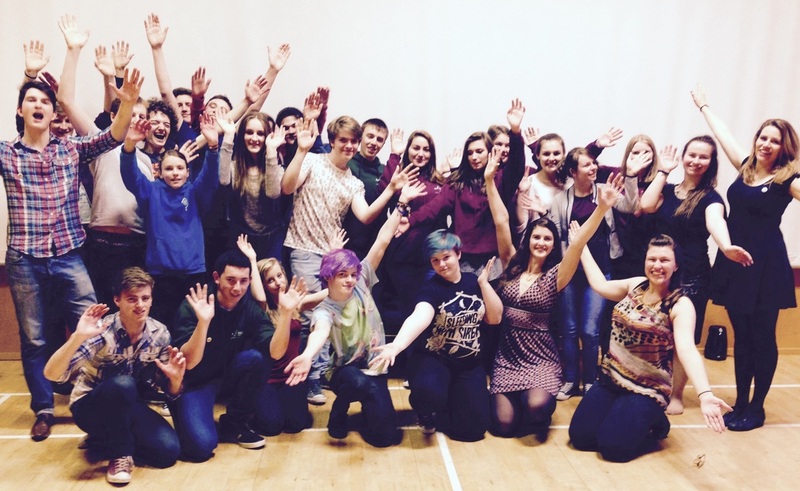 Leading the workshops are step dancer Sophie Stephenson along with beatboxer Lewis Macrae and Gaelic singer Eilidh Munro. There will also be a “riffs and rhythms” instrumental workshop led by multi-instrumentalist Marit Fält. 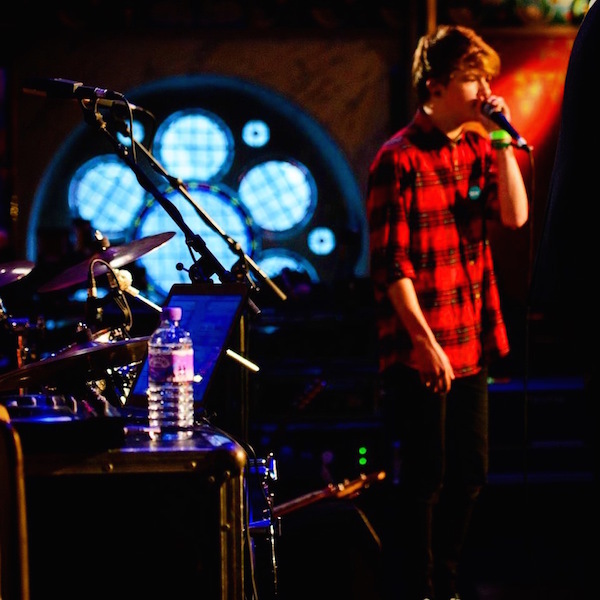 The workshops are open to everyone aged 12 or over, regardless of musical experience. If you already play an instrument then bring it along. Otherwise just bring your voice, your feet and your energy! A pair of hard soled shoes is advised for step dancing. Also don’t forget to bring a bottle of water and a packed lunch. The workshops will be in Plockton High School Hall on Saturday 3rd September from 11am till 4pm with a lunch break from 1-2, and on Sunday 4th from 11am till 3:30pm. The workshop fee is £20 per day or £35 for the weekend, but if you book by Friday 19th August a weekend ticket is just £30. Email sophie@sophabulous.co.uk to book your place. On the Saturday evening at 7:30pm there will be a concert with the TradBeats tutors and pupils from Plockton Music School. Tickets for the concert are £8 (full price) and £5 (usual concessions, and workshop participants) and will be available on the door.